Liam Neeson came by to talk to Kelly Ripa and Michael Strahan. He’s an Oscar nominated actor who’s been in Schindler’s List, Taken, and Taken 2. He shook nearly everyone’s hand on his way up and then he said he had a wallet when he came in. Kelly said that someone in the front row must have taken it. Kelly called him very handsome and said that she likes to call him reluctant about it. He gets a lot of attention, but always seems to deflect it. Neeson said he pays them all. Michael’s a huge fan and said that it seems like Neeson can do anything. He asked if there was anything Neeson said yes to but hadn’t done before. Neeson said, “Oh yeah.” There was a film in 1980 called Excalibur, which the director wanted to do all in Ireland. In order to even get into the room you had to be able to ride a horse, which nobody could do, so Neeson and the other actors lied. Then they all had to demonstrate their riding ability while in armor on “the Rolls Royce of horses.” They were in medieval saddles that made them look like “man and beast are one,” but all of them were freaking out inside. Kelly said that’s terrifying, but it all worked out okay. Neeson loved boxing before he was an actor. They showed a picture of him when he was 11 years old. Michael asked why he gave it up and he said, “It started to hurt.” He started when he was nine and stopped when he was 17. He also couldn’t afford the time to train more. His favorite boxer is Mohammad Ali. He didn’t even hesitate when Kelly asked. That’s just a given. Neeson met him a couple of times. He still has a photograph he cut out of the newspaper of him. Neeson said “he’s a God,” in that picture. They then talked about A Walk Among The Tombstones. Michael watched it last night and he loved it, though he was scared. He felt better because Neeson was there. He plays an ex-NYPD cop. Neeson and the cops love each other and Neeson talks to them all the time. His character’s on the border of good and bad. Something terrible happened to him and he got off the force and now he’s a reluctant and very unlicensed private investigator. He treads a line that’s “maybe on the bad camp more than the good camp.” He’s reluctantly hired by a drug dealer to find the guy who killed his wife. Mark Consuelos is actually in this movie. Kelly asked what he’s like to work with. Neeson joked that he was having a little trouble answering, but then he said he was great. Neeson said the real test is if he can believe the words coming out of an actor’s mouth, and Mark’s a great actor. Neeson also had to stay in shape for the movie, but he doesn’t do his own stunts. He does do his own fighting though. They played a clip of A Walk Among The Tombstones where he meets a guy who says he can’t let Neeson leave or they’ll kill him. Neeson then threatens to kill him. The other guy was an Icelandic actor. Michael said he just got another quote he’s going to keep saying from that clip. 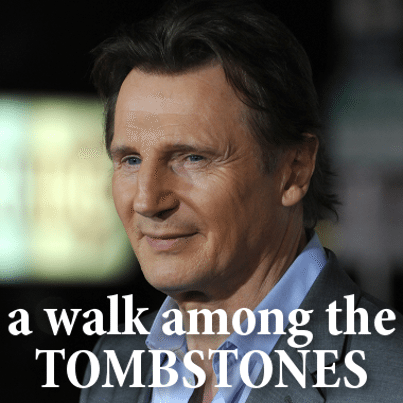 A Walk Among The Tombstones will be in theaters on September 19 2014.